How do I improve my internet protection? the biggest threat on the internet is YOU! The internet has provided access to one of the greatest resources at our disposal but it is a sad fact that it is now rife with criminal activity because it has never been easier for your identity or information to be stolen. But the biggest threat on the internet is YOU! Now this may sound surprising but none of this is your fault. Most modern computers typically have built in firewalls but the criminals have the next step by exploiting the security holes in your Browser or Operating system. The are two ways we can ease your concern. System Health Check – our System Health Check Service does exactly what it says on the tin. We perform many checks on your PC, and give it a full valet, to ensure that there is no nasty software hanging around in the background. Security Review – we review your current security arrangements and advise the best solution for your budget or you can use our system. This ranges from utilising free tools to check your system to automatic commercial software and hardware to drastically reduce your chances for compromise. Contact us today for advice on our internet security service. 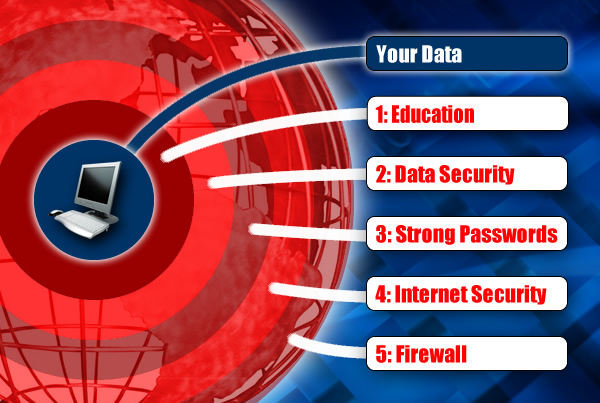 In the business world they focus on 7 layers of data security but these do not all apply in a home environment. However we have chosen to focus on 5 of them because a small change in these key areas have a big impact on protecting you and your data. These layers work from the inside out starting with your data and personal information. Consider your existing arrangement and see how it fits. Education – Make everyone on the household aware of the importance of internet security. Teach them to be vigilant whilst browsing and trust nothing. And most important of all, do not give your information to anyone you do not know. Data Security – make sure your data is safe. In the event your machine does get attacked, you could lose your existing data. So it is important to back up your data to another source, like a storage server, so you have always have a copy. Strong Passwords – these can be a pain but they are also, in some cases, the only line of defence to your data. Make sure you take a sensible approach to using more secure passwords. Read more on this below. 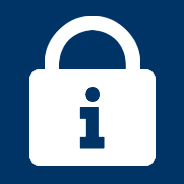 Internet Security – make sure you have a good, and up-to-date, internet security suite installed on your PC. There are a range of free and commercial products that include personal firewalls, antivirus and spyware to enhance your protection. Firewall – If you haven’t already got a broadband router then this is the best way to protect home computer and share your broadband. We also supply a dedicated commercial firewall that has been sized for home use. The other two layers not included are Power Protection and Physical Security as these normally apply to dedicated computer rooms.